If you’ve seen Disney’s animated adaption of Beauty and the Beast, you might remember Lumiere, the talking candelabra who helps Belle through the castle. Candelabras are as charming in real life as they were in the fairy tale movie — bright, beautiful, and able to draw you and your guests into the romance of the moment. Candelabra wedding centerpieces add magic to the chamber they grace, and if you want some of your own, here are some tips for choosing good ones. Decide how many prongs you want. 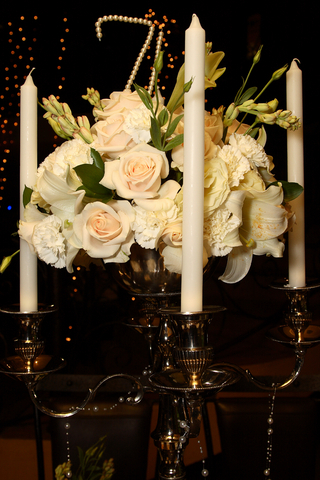 Candelabras come in a variety of sizes; some have just three prongs, others have up to seven or even more. Remember that you’ll have to purchase a candle for each prong, unless you just enjoy the lightless decorative properties of the candelabra, so unless you’re okay with spending a fortune on candles, you may want to go with fewer prongs. Check the material with which they are constructed. Some candelabras are made of glass or high-quality metal. However, some companies try to pass off plastic painted over with metal as being of a higher quality. Before you pay top dollar for some inferior candelabras, make sure to check to see that you’re getting the material you want. Also, choose something that won’t easily shatter or snap during transportation. Choose something you can reuse later. A candelabra wedding centerpiece can be very expensive, at least if you plan on purchasing a quality one. If you can, minimize the number you buy (maybe alternate every few tables with another, less elaborate centerpiece), and choose a design you can reuse in your home. While you may like that candelabra with bright red glass hearts on each prong, you may not like it in five years when you’re trying to redecorate your house. So pick something that will go with almost any design.